Training Philosophy | Smart Start Stable, Somerset Wisconsin, U.S.A.
Good horse training is an evolution. Good trainers are always striving to improve what they are doing, working to have a better partnership with the horse, helping the horse to understand better, helping the horse to perform better, striving to be better, be a better rider and handler. It’s been a long time since I’ve updated the Training Philosophy web page and with all of what I’ve learned in the past two and a half years it’s past due. As a background, Wayne started me on a path of what was loosely termed “natural horsemanship” in 1999 when I was having an extremely difficult time working with Safarr. Wayne worked with me for 2 summers when I was still an amateur, after which we went our separate ways. 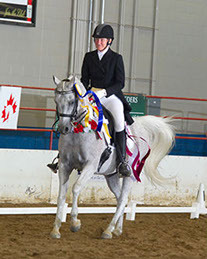 In January 2015 Wayne and I teamed together to offer help to people searching for better relationships with their horse, a better performance horse and my personal favorite, a better dressage horse, giving them a place to come and learn. The following is more what I’ve learned about horses and training than just a training philosophy but I would love for others to know how absolutely amazing working with horses that Wayne has had an influence on can be. Wayne specializes in foundation training. He understands horses, how they think, respond, learn, how they behave and how to get them to behave the way we need them to behave for everyone to be safe, better than anyone I’ve ever met. First and foremost, the human must be safe when around the horse. Second, the horse must be safe. These two requirements must be met first before any refined training can be honestly done. It’s the kindergarten and grade school work. A person cannot do algebra or calculus if he/she hasn’t learned adding and subtracting, multiplying and dividing. The same type of training scale applies to the horse. If a horse cannot be respectful of a human, stand relaxed and quiet, be soft and relaxed while saddling, bridling, getting blanketed, having farrier work done, pretty much all the basic things horses need to be OK with in their daily life, they will never be trusting horses and will never achieve the best performance they have inside. As a side note, all horses have basic fear instinct. This has been talked about by many riders and trainers. What Wayne does is teach the horse to give up those basic fear instincts through the training he does. He teaches the horse to deal with whatever they want to hold out on and protect of themselves. If a trainer only works on the surface of the horse that fear is always in there, there is a chance, like roulette, that one day something will happen that will overexpose the horse and that fear will come to the surface in the blink of an eye and horse and human can both get hurt, maybe even killed. We’ve all heard horror stories and maybe even witnessed or been part of horses doing this. Bad things happen all the time, we cannot train for every little thing that may frighten a horse but we can train them to deal with their fears so the reaction isn’t deadly. I’ve witnessed Wayne literally change the way the horse lives and deals with fear. A horse that wanted to bolt from any noise behind it, could barely stay standing still, couldn’t hold things together, even after a few years in full time training with other trainers, came to Wayne and made a total transformation. He started to look at all the pieces of the world around him and not the whole world as a scary place. I remember the day it all started to come together for this horse, like pieces in a puzzle. It was like he opened his eyes and realized that it was only a manure bucket in the corner, only the apple picker in the manure bucket, only ground poles in the corner. He had a completely different look in his eye and was completely changed in how he viewed his life. His sweet personality could finally come to the surface and his confidence was nothing short of amazing. Wayne says that the horse carries that fear in their body 24/7 and will their whole life if we don’t help that horse figure out how to deal with it. The key to the basic foundation training applies to the upper level training. It’s all the same, just refined to a higher level. It’s always about refinement, getting better, getting more in tune, getting more balance and of course, softness, softness, softness. Lateral flexion = the give to the bit= looseness in the atlas and axis of the poll. The horse must be soft, always. Always, always, always. And always some more. Connect to a body part = if we only give to the bit we only move the head and maybe the neck. This would create a “rubber necking” horse, one that would bolt with it’s head turned all the way to the stirrup. We need to be able to move the hip with the rein. We can break the resistances in the horse by connecting to a body part, whether it’s hip, shoulder, rib cage, left front foot, right hind foot, whatever body part is holding out on us. In the refined stages cues are transferred to legs and seat with the hands more for keeping softness and lateral flexion. Upper level dressage horses need to be adjusted and balanced quietly and softly in often tiny changes, in dressage terms, half halt. When horses understand and are soft they are wonderfully lovely to ride. Wayne started my young horse, Opus Dei (aka Oops). I have learned more from riding this green horse than all of the other horses I’ve ever ridden combined. I put into Oops what I’ve learned on other horses but that softness and his never having learned anything wrongly makes him amazing. I have to keep upping my game on softness and timing in my dressage work as he responds perfectly. It’s like reading a dressage instruction manual and then going out to try it on your horse and having it work! When it doesn’t work right I have something not soft enough and I go back to some foundational training exercises and get the softness back. Then it works. I am working hard to keep up with riding correctly on Oops, he’s like a mirror as to whether or not I’m doing something right or not quite right. Because the foundation of training in the horse is most important, this article has explained mostly the foundation part of what we do. Dressage becomes so much easier when the foundation to softness and the learning process is built into the horse. The softer a horse is, the easier it is to ride and the better it performs. The correct dressage training aids produce the correct response from the horse and works with their body and not against it. Again, Oops has shown me to a whole new level how true this is. He is soft and responsive, if I adjust my seat or legs just a tiny bit he responds. If I’m having a problem not getting the perfect bend, or if I am trying to do a shoulder in and it just isn’t lining up correctly I am often not balanced and weighting my seat bones or I’m holding too much stiffness in part of my body somewhere. When I do a body check and relax a part or weight a part of my body differently the pieces all fall into place. It is most amazing. I am learning at a new, higher level, to not try too hard as that produces a brace in my body which allows a horse to stiffen and brace against me instead of yield to the pressure. Riding Oops is also teaching me to an even higher degree that correct dressage is the correct way to ride a horse in balance, making them stronger and able to do even greater things with ease. I hope this article has given you a little better idea of how we train horses at Smart Start Stable, the philosophies behind our training, and the respect we have for the horses.